Lucky for the pair their walk to the plateau had gone unimpeded. Now they were some 50 or so meters out, hiding behind the tallest dune they could find. It was by no means good cover but it was the best they could ask for given their environment. She knelt, leaning over the edge to take in the scene. It was truly something to marvel and to think it was created by gods during some battle of old. The world that they lived in truly was a wonderful and terrifying place. Ducking back behind what cover they had, Haruko sighed, wiping the sweat from her brow. "Nothing left to do but to do it." With that the small samurai stood and with her many swords clinking softly as she walked, approached the mines that would be their striking point. Luckily it was nearing late afternoon and the number of people working the mines was much less than it would be during an earlier portion of the day. This was done for a multitude of reasons, but mostly Haruko had chosen this out of respect. She had no personal vendetta with the Land of Wind or it's people. The workers here, they had no say in the war that was waging and thus it should not also fall on them to pay for it. She closed to within twenty-five meters of the closest mine shaft and sighed inwardly before reaching for her massive sword strewn across her back. "I hope in time you will forgive me." She readied the blade, "And that I will one day forgive myself." Chakra began to flow down Banryu as she pulled the blade backwards and with a mighty swing of her hand, "Getsuga...Tensho." She whispered before launching a massive arc of concentrated power directly toward the opening. Should it go without being interfered the entrance and likely the mine shaft itself would crumble and collapse under the force. One down, but how many more to go? What had used to be rolling dunes of sand abruptly transformed into a beautiful formation of glass, as the two of them approached. As they moved themselves out from behind a sand dune, Astora took a second to admire the unnatural environment they found themselves in; appreciating how unique of an area they found themselves in. Then the second passed and he followed his sensei towards the several mine shafts that had been created in this land of glass. Haruko had focused her attention on a mine and seemed to be getting herself into the zone. Astora walked several meters away from his teacher and set his sights on a mine shaft about 75 meters to the right of their current location. The monk would quickly blink; replacing his black eyes with rippling purple ones. Chakra surged through his body and focused into his right palm; causing the skin to change into metal and creating a cylindrical cannon. He took a deep inhale and raised his right arm to face the mine shaft. Focus. You can do this. He exhaled as his nerves began to loosen. Bright blue chakra began generating inside of the cannon and would continue to build up for several seconds. The bright blue energy would shoot from his hand cannon outwards, in the form of a thin beam of light. If it successfully collided with the mine shaft, a massive explosion would occur; obliterating the structure, the materials below and within it, and anything else nearby that wasn't unnaturally sturdy. After firing his laser he would take a second to look over to Haruko and see how she was doing, but would immediately turn back to his own work. He had plenty of energy left and was ready to use it for his mission. It felt like just as soon as Yui had received Shingen’s body in the scroll, she received word of something near Sunagakure causing trouble. Though off duty, she was still one of the only higher ups in the village, and was asked to take care of it. She would do so without much complaint, but her heart was heavy and she wanted the confrontation to end as quickly as possible. She would approach the area fully cloaked in desert fashion, hiding all but her eyes. The scythe was bundled on her back, but ready to be removed for attack. It appeared they were targeting some of the nearby resources of Sunagakure, specifically some of the mining facilities. The area was being evacuated, many running for cover away from the attackers. Yui knew she had back up coming soon, but she would attempt to scope out the area first. Her real body hid above the mine shaft area behind some rocks. She would remove the scroll and unseal the portion of the scroll that contained Shingen’s sword. Though she had not seen it in action much, she knew it could be very useful in this situation. While behind the rocks, she performed a quick sun salutation. Her body held the final pose of raising her arms. Her spirit separated momentarily from her body, and moved down to where the others were attacked. She landed in a kneel on the ground in front of the attackers, and then stood full. It looked like Yui, at least in her cloaked form, with her hazel eyes peeking through. Her body, however, looked corporeal, sometimes shifting and moving and blurring around the edges. Yui recognized at least one of the attacking shinobi from the VIP box at the Chuunin exams. A Kumogakure nin... but why here, attacking them? That part didn't add up. It seemed that both her and Astora's attacks had been successful, leveling a fifth of the mines that needed to be destroyed. She felt no satisfaction in what she was doing other than the small sliver that came with doing what Lady Shizuka found right for Kumogakure. Thankfully it seemed the casualties had managed to stay very low, the people evacuating quickly and avoiding the points of impact. No sooner had they begun did they receive their first bit of resistance. As the wind blew, the smell of burning wood tinging the air, an image of a familiar set of eyes and voice stood between them and the mission. The way the body moved was inhuman and the samurai wondered just what kind of opponent they would be if it devolved to that. Truthfully she had wanted to simply hit and run with no one truly getting hurt other than the wallets of Sunagakure. It seemed that her want would likely not happen however. "We wish no harm to any individual of Sunagakure but as your village has declared war on another, we must look out for ourselves. I'm sorry to say that there can be no talking this day. Our will is steeled by the words of our Kage, I'm sure you understand the situation that puts us in. We will take our leave peacefully once the mines are no longer." Haruko's voice was short and sharp, leaving little room for an argument or an interjection. She was already unhappy with the lot she had drawn but it was still hers. She would do what she must for the betterment of Kumogakure. She only hoped that did not mean she had to cross paths with whom she believed this to be. If this was indeed the woman she met from the VIP rooms, who lost her husband so recently, she did not wish to add more pain if she could help it. The mine shafts exploded into pieces as the two kumogakure assailiants succesfully unleashed their attacks. Before they could continue their assault, a ghostly figure appeared before them who seemed to be a Sunagakure shinobi. She ahd immediately called them out on being from Kumogakure; most likely due to their appearance at the chuunin exam. Although the technique looked like ones that he had used in the past, Astora couldn't pinpoint exactly what she was doing. It looked like she wasn't actually there, but he had been fooled before. With his arm at his side he would begin to charge chakra into his cannon. After four seconds had passed he would raise up his arm to aim and release another chakra laser at a mine shaft approximately 100 meters away 20 degrees to his left. The ghostly women pleaded that the two of them just leave without the need for fighting, but fighting was already happening. Sunagakure had decided to join a needless war, and now consequences needed to occur. Astora's bright purple eyes would avoid eye contact with the woman. It wasn't personal, but it was something that needed to happen. This is just the beginning. Yui could only frown at the response of the Kumogakure nin. Of course it was her duty, given by order of the kage no doubt as a result of the war they were currently in. She wondered if Kyousuke had never expected the war to come to their shores. The samurai woman was no doubt more powerful than Yui; just from what she had seen already she would prove to be a formidable foe. The holograph let out a sigh, watching as yet more of her country's resources were destroyed. "Very well, then. I'm sure you will understand the situation you put me in as well. I mean you no harm, Kumo-nin, but I cannot stand idly by." With that, the apparition in front of them would disappear as Yui's spirit returned to her body. As soon as this had happened, from behind the dune Yui quickly ran through a series of movements with her scythe. As soon as they were done, she sat into a meditative form. She would emerge from behind the dune floating, a corporeal green mist about her. Her eyes and her bindi glowed the same misty green, and the large war scythe floated around her, double sided and enlarged to even larger than the woman's body. She was floating in the meditative pose, unable to leave it for not to give up this form. She was not very fast in this form, especially not as fast as the samurai, but it was the only way she could think to potentially match her abilities. She approached at a normal speed to the samurai, but was mostly on guard with how quickly the samurai might react. It was likely this woman moved quicker than Yui could see, but she would still do her best to avoid the samurai's blade nonetheless. The scythe was large enough to block most basic attacks even if held at a neutral position. She would make an attack if the woman did not first, but for now the scythe floated in front of her, straight across her body, ready to spin in circles at a moment's notice. "I implore you, one last time, rethink your decisions here." As a person who was damaged, Sahara never wanted to see her village face the same fate as she would inevitably face in the line of duty. She was disheartened to know that an attack had been launched on Sunagakure in regards to the pointless ongoing war. Sahara hated the idea of Sunagakure even being involved in a war. She knew it was her job as a shinobi to participate in battle, but she felt it would be in Sunagakure's best interest to have isolationist values so that they wouldn't be influenced by any outside sources. Now here they were, in a seemingly pointless war that they honestly didn't need to be in. The ongoing ruckus was a result of this and any loss in life could only be faulted to Sunagakure's own participation in the war. But Sahara's opinion was neither here nor there. Her action would have to fall in line with her duties. Sahara floated through the air on top of her giant folding fan in order to head towards a situation she had been alerted on. Someone had already been sent to handle to situation and Sahara had been sent as backup just in case. From what she could see, a large beam of energy was being fired off at the mines and causing massive destruction to their structure. Unfortunately, she had arrived too late to prevent the situation but she would not let any further damage be done to her village if it took every ounce of chakra that she had. Sahara was now soaring over the mine shaft, coming from the opposite direction of where the laser was now beginning to fire and making an effort to avoid any cross fire and smoke. Her hands would clasp together and just as she had done so, the sand that bathed Sunagakure's floors would begin to collaborate with the magnetic field she was now sending out. Two plumes of sand would explode from the ground right under the laser and begin taking on the impact of the genin's attack. More and more sand would begin to conjoin in order to eventually form a wall of immensely condensed sand. Once Sahara saw that her sand wall was fully taking on the attack, she would leap from her fan and land directly behind it. Sahara would equip her closed fan into her right hand as she used her left to manipulate the sand that would keep a strong defense against the chakra laser. "Sorry I'm late." Sahara would keep her sand held strong until the laser let up, but for now, she would remain on the defense. As expected neither side was willing to simply walk away from this. It was a shame really. Haruko knew of Yui's loss, at least of her husband and she had shared in that pain during the Chuunin Exams. Sheathing her sword, the samurai bowed her head toward her opponent. No matter the sides someone of Yui's position still deserved respect. At least she assumed it to be Yui. There weren't many monks that made it to the rank of Jounin in the Hidden Sand, let alone one's that spoke with that voice. "No matter the outcome today, I meant what I said about your husband. I do not wish to add more to your loss but I will not go against the orders of my Kage either. I apologize for anything that is to come." As she finished, the sand close to them churned and formed a wall some distance away that blocked Astora's second laser. The two met with seemingly equal force and it seemed the wall would hold as long as Astora did. The source of the wall showed itself, an impressively tall and lanky woman. 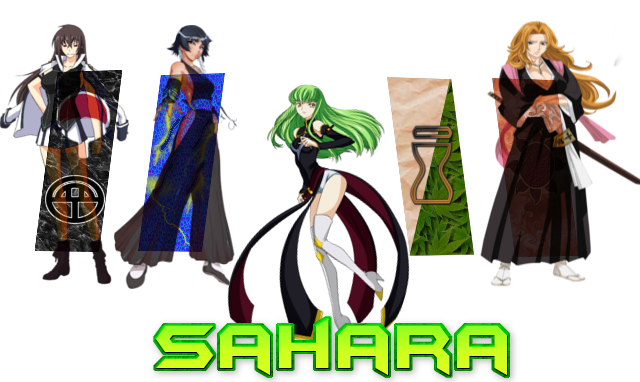 Sahara Satetsu. Haruko knew the description of the Jounin and it was not difficult to put two and two together. Two Jounin, this could prove much more difficult than originally thought. Her eyes glanced over to Astora but did not linger long. She was confident he could at least survive until she could deal with the opponent in front of her. The addition of the Satetsu clan head was unnerving though. Until now there hadn't been a shinobi among the battle. Monks at least followed similar principles to herself but those monsters that molded chakra, those were much more difficult to compete against. "I have not changed from my path." With that, the talks would be over. She leaned back, her arms going loose and then, in a burst of speed she ran forward. Her platinum blonde hair whipped around her as each step in the sand kicked up a small cloud of the particles. She had not drawn her sword since placing it into it's sheathe. It was something that Tetsujin had taught her long, long ago. Never show your true strength to an enemy you plan to keep alive. Closing the distance in a flurry of erratic steps from side to side, the woman's eyes stayed wide and locked on her opponent. Her past conversations with Shang and Astora on the nature of monks had given her insight into how the stances worked. As long as Yui held that pose, whatever power she was using would be active. That only meant that Haruko needed to break the pose. It was no different than an Iaido to a handseal, although this time she was the Iaido. She dove in toward the side of the scythe that did not contain the now double-sided blade and moved to punch the woman's side aiming directly for her kidney. If her approach had indicated anything, the difference in their speed was blatantly apparent. Her feet planted firmly in the sand, digging in softly as she twisted and moved the force of her strike from her hips all the way to her fist. She kept her free hand raised around her midsection, waiting to respond to whatever the woman's reaction would be. She made sure to position herself as to keep Sahara in her peripherals at worst, unwilling to take her eyes off of either opponent. It was then that the others would make their appearance. In consecutive flashes of smoke, sixteen shinobi poofed from various locations though most had simply hidden beneath the sands. They were the force that Shizuka had lent Haruko for the mission. While the samurai could not speak for their competency, she was more than aware that an advantage in numbers was well worth having. Half of the shinobi stayed near to Astora, meant as a line of defense against the stronger opponents, while the others charged off toward the mines to destroy the ones remaining. The woman who had shown herself to them wasn't alone. As the monk had unleashed his second chakra laser, a wall of sand rose up from the desert to intercept it. As the laser collided with the sand, both attacks dissipated in a white explosion. Astora lowered his arm and put up a fighting pose as he witnessed a woman wielding a large fan standing nearby the sand wall that supposedly she erected. So this is my opponent huh? The monk glanced over at his sensei and witnessed her engaging with the woman from earlier. Haruko hadn't drawn her blade yet; this gave him an extra layer of confidence. If she wasn't going all out right away then he would hold back his transformation until it was absolutely necessary. Once the sand wall had dissipated, Astora would punch forward with his left hand and a twist of his hips. A powerful shockwave erupted from the young man's fist and head towards his green haired opponent's chest. If she can manipulate sand then I need to be careful until I can fully comprehend her limits. He would blink; reverting his purple rippling eyes back into his normal black ones. If he could help it, he would try not to reveal all of his cards all at once this time. Yui could not help but wince at the woman’s words. It further solidified that she did not want her as an opponent. She was sorry that it had come to this, but they’d both said their own, and the time for words was done. As Yui prepared for the samurai’s approach and the young boy went to destroy more of the mines, another presence entered the playing field. Sahara apologized for being late, to which Yui could only smirk (not something she could see anyway, but still). “Don’t worry about it,” Yui’s voice called to her in a somewhat ethereal tone. It gave her some comfort that her fellow jounin had shown up to defend as well; Yui had been somewhat worried about fighting this powerful samurai woman. She was surprised to find, then, that Haruko was not using her sword right away. It almost felt disingenuous to Yui, though perhaps she was thinking she could find another angle. You may be quick on your feet, young one, she thought to herself. But this can swing quicker. The samurai woman swung toward one of the edges, using only her fists. Yui could watch, and though her body could not react, there was not a need for that right now. With a thought, the flat side of the scythe swung in a fraction of a second to meet her fist. The blade would spin, twisting toward the woman’s arm. This move wouldn’t slice her (as it was just the flat side of the blade) and would only hit the arm, but as soon as it had spun, the pointed edge now facing Haruko turned to swing toward the woman’s midsection. Yui did not intend to puncture anything that could cause the woman death, but she wasn’t above grievous injury to stop the assault. The monk’s eyes turned toward the others coming to destroy the mine, and her heart skipped a beat; she could not at present, however, easily take care of them. Not until she was done with Haruko in one way or another. The wall of sand that Sahara erected managed to defend against the blow perfectly, causing an explosion to disperse over the area of impact. Immediately Sahara prepared herself for whatever was next, knowing right now, playing a defense would be the best option. Despite the fan being large, wielding it with one hand was something that was of ease for her. Seeing that the boy had been preparing his next attack from a distance, she was able to guess he was either going to come at her or release some other long ranged attack. In one fell swoop, Sahara waved her fan from left to right twice, releasing a large blade of wind from her fan in the same direction as the boy, more than likely colliding with the force that the boy had sent after her. In her next movement, Sahara would release another blade of wind to follow after the first one, this time aiming the blade of wind towards his legs in order to catch him off guard. Knowing the the blade of wind would probably be easily countered by either him or one of his accompaniment, Sahara kept her guard up. The sand underneath Sahara would suddenly pressurize into a platform that would lift her directly into the air. She had more to deal with besides this boy now so she couldn't set him as her sole focus. She was now faced with either one of two options: take him out quick and deal with the others next or take the others out and then deal with him. There was also another option. Sahara began advancing forward, keeping about thirty meters between them. More men were now accompanying the boy in order to serve as backup, giving her more to have to deal with. While her right hand held onto her fan, her left hand would begin forming two quick hand seals. After doing so, her hand would stretch forward, causing a cordon of sand to swoop in front of her from the platform that she stood on. Six projectiles would launch from the the sand and pinpoint Astora as well as five of the men that had come to his assistance. Due to the bullets having a concussive force, Sahara was not afraid to aim at several of the heads of the men, knowing that if the attacks were to succeed it would only knock them out. The projectile coming for Astora would go for his chest, aiming to deter his defenses as much as possible. It was moments like these that Haruko was thankful for her time spent with Tetsujin. The older samurai had not been the fastest mover but his mind was faster than any swordstroke that Haruko had ever made. He had taught her that same quality, to clear her mind of all things that didn't matter and to focus on the task at hand. She had used what she learned from that lesson more often than she could remember. As she approached the monk she noticed that Yui did not move from her floating position. This served to prove her assumption that whatever power the Jounin was using was tied to that stance. The next assumption was of the woman's scythe. It was not held in her hands so likely was moved through her mind. The premise sounded similar to the way that some shinobi used puppets in battle. If that similarity was any deeper than premise that would mean a small time lag would be present between thought and movement. The blade of Yui's weapon moved up to meet her fist. The speed was much more than she had expected from seeing the previous movements of her opponent. While it did move quickly, Haruko moved just as quickly and she noted that it's form was nearly perfect, but again it failed to compare to the samurai's own. The firm footing she had in the sand gave way to her standing on the balls of her feet instead. She had no intention of reaching for her swords, but she also had no intention of that blade ever touching her. As the blade moved up to meet her fist her body halted completely, her clothes shooting forward from the momentum of the run that had lead her there and the block missing her. She then danced a step backward, arcing her stomach back and away from the blade as the scythe swept toward her midsection, the blade reaping only air. Moving to meet the monk's eyes with her own, she noticed that in spite of the swing Yui had taken her eyes off of the samurai. I may not be aiming to kill, but I would never move my attention away from an opponent. As the snath of the scythe cleared her she dashed in, this time with slightly more ferocity to her approach. Yui had sent mixed signals with the last attack. She performed a slashing attack that would easily inflict a wound that could end the battle but then turned her eyes away. Haruko however, would send no such mixed signals. Dashing parallel with the snath of the weapon to her left, she moved to deliver a straight punch to the woman's sternum with her right, her movements slightly erratic but still done with the samurai's unyielding and perfect form. Elsewhere on the battlefield five of the men brought along with them took shots of sand to their heads and bodies, crumpling under the attack. The remaining three with Astora launched a series of fireballs, lightning bolts, and kunai at the Satetsu. The eight that had ran off toward the mines went unimpeded and with a series of explosive tags, destroyed another of the mines the Sunagakure shinobi were sent to protect. Following the fall of the sand wall, three of the kumogakure reinforcements jumped in front of Astora giving him a quick nod as if letting him know that they were here to help. With almost synchronized movements, the three shinobi unleashed a wall of fire towards an incoming blade of wind. Unfortunately for the three of them, their flames were nowhere near the strength of the sunagakure kunoichi. The wind blade would continue through the fire and slice through the soldiers' legs. A quick moment of realization hit Astora that was followed up with a quick wave of nausea. The monk averted his eyes from the crumpled forms of his allies and focused at the battle at hand. Without any healing ability at his disposal, it wouldn't help the situation to freak out over something like this. The green-haired woman began manipulating the sand around her once more; creating at platform and sending her into the sky. This isn't great... My array of ranged techniques is limited... Will I need to use the laser again? His thoughts were interrupted by a gathering of sand in front of the kunoichi. Alright it's time then! Astora's eyes transformed from a pitch black to a rippling purple, as a serrated metal tail burst out of his rear. A shower of sand shot towards the monk and his teammates in a widespread area. Once more the monk would twist his body and throw out a shockwave to intercept the sand projectile that was aimed at him. His metal tail would curve out in front of him to block any leftover damage from the sand. From behind his tail, Astora would punch once more; aiming to send a shockwave out that would hit her torso. The rest of the shinobi that had assisted Astora were knocked out by the sand barrage. Was there nothing he could do to protect his allies? The woman was naturally able to dodge the attack with ease, as Yui had predicted. She was fast and accurate, a deadly combination to be sure. As Yui’s quick glance over at the other shinobi turned back to the woman, she made just an equally powerful return attack, if not more powerful. Yui knew for certain that this woman over powered her, and even her best attacks likely wouldn’t be able to stop her speed and precision. The hit would land, knocking the wind out of Yui and knocking the woman out of her stance. Yui would be quick to grab the scythe as it left its telekinetic control and swing it towards the woman, albeit with less precision than before. Hopefully it would cause her to jump out of the way, after which she would bend down in a scooping motion, potentially avoiding any retaliation. She would then raise herself back up and force her hands outward. Spiritual energy would burst forth and knock into the woman, hopefully knocking her back ever so slightly but still within range. Even if she wasn’t knocked back and had merely dodged with her great speed, Yui would move on to her next attack, aiming at wherever the woman would dash toward. Yui would then hold her scythe in her right hand, and step forward with her right foot and thrust her left hand forward, sending out another sort of shockwave that would hopefully strike and damage the woman further. She would then bring the scythe around in a downward slashing attack. She felt worse by the minute knowing it wasn’t likely they would defeat their opponent, but Yui had promised she would try her hardest so that she would. For only a moment, Sahara's eyes scanned the entire surrounding area. She knew that Yui should be able to handle herself to at least defend against her opponent so she wouldn't pay any mind to their match, rather the other people attacking the mines. Sahara was now 20 meters from the ground as she would wave her hands from both sides of her body into the front of herself, clasping them as if in prayer. Four tendrils of sand would swarm from every angle around Astora, attempting to wrap around him in some of fashion all at the same time. The tendril which would assault him from behind would attempt to wrap around from his right shoulder and down to his waist in the same fashion as a seat belt. Another tendril would branch from this same tendril and begin wrapping around his tail in order to fully encase the new appendage as well. She couldn't take any chances as he could be able to channel the same compressed force as earlier through his tail. The other sand tendrils aimed to wrap around his entire body until it was fully encased into a large pile of sand only exposing his face. The boy was steadily making himself a problem, making it much harder to deal with the other shinobi. If this were successful, Sahara would hold together the formation surrounding Astora with a single hand gesture with her left hand. This wasn't her only attempt however. The eight men who had just successfully destroyed one of the mines would find that any further actions would be halted by tendrils of the same fashion as the one's attacking Astora would wrap themselves around both legs of each men. Had nothing halted this action from happening, Sahara's right hand would part ways from her stance and quickly turn into a clenched fist. The moment this happened, all eight of the men would find the lower halves of their bodies immediately crushed.n. The large bones that made up their legs would be fractured from several different points in the matter of an instant. It was an injury they could survive, but no longer fight in unless they absolutely had a death wish. Her fist met with the woman's body, sinking into her cloak and chest before knocking her out of the stance she had previously been holding. The monk was not so easily bested however, her hand reaching out for the now free-falling scythe. As if in slow motion, the samurai saw the slash coming. 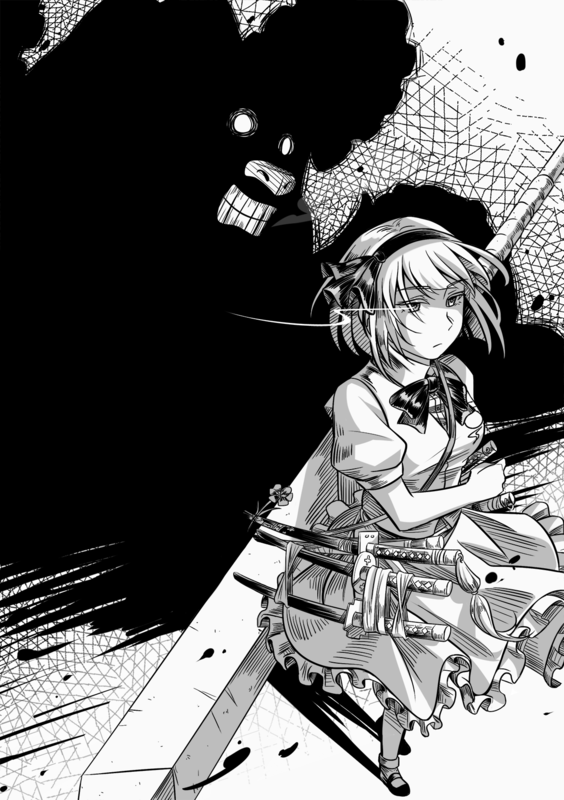 Now that the stance had been broken Yui's movements had sped up but her scythe had slowed down slightly. She hopped lithely backwards and out of reach of the attack. Her eyes then caught sight of it. The scythe moved past her but her focus had turned to her student and her back-up units. Sand was beginning to churn around them. Not again. I will not have a repeat of the Exams. I know you can hear me, beast. Help me. Help me save my student. In a blur the samurai reached and unsheathed each of her eight swords, placing them in the crooks of her elbows, her neck, and an upraised leg. The faintest of red hues washed over her body as she tapped into the beast inside of her. As Yui finished her scooping motion the image of Haruko would simply vanish as if it were a mirage formed from the desert. She had already moved to stop the other Jounin but moved in such perfect grace that Yui's eyes hadn't believed her. A furious blink and she had already closed the twenty meters to Sahara, leaping upwards at the airborne Jounin. Before the Satetsu could finish surrounding Astora in the sand, Haruko flickered, not with some technique but with sheer speed, in front of her, eyes blazing with both anger and desperation. The points of all eight of her swords began to glow a fierce pink and with one rapid spin of her body, "Getsuga Tensho." She whispered quickly as the world fell silent under her breath. She had been unwilling to pull her swords. A foolish act. She had wanted to show these two shinobi the respect that their rank deserved. An honorable act. She had wanted to walk away from this without causing any harm to them. A hopeful act. Unfortunately her hand was forced by the Satetsu. A foolish act. Her fights with Hayate, having seen him in the war, she knew what that sand was capable of once it surrounded a man. It would be over in a second, one way or another. In the same moment as the words left her lips, the eight points of light flared and each sent forth a massive crescent wave of energy. Two would cross against Sahara's chest, two would aim toward Yui, and the final four would aim to crush the remaining mines. After having witnessed both of their movements, having seen the extent of their speed, she knew that only Yui would possibly be able to dodge from this range. Even then it was unlikely however. The waves were not meant to kill but merely incapacitate, as she blunted the four that would be striking her enemies. She would then fall gracefully to the sands, her body tense and ready should either of the opponents not be struck down by the onslaught. She had hoped it wouldn't come to this. Her body swayed softly in the ways of her village's teachings. Even now her movements would be hard to read and equally hard to predict. "Do not push me further." She warned. "Lay down your weapons. You have fought well, Suna-nin. No one will deny that. I beg you do not continue. I wish to leave the sands the color that they are. I have no intention of spilling Sunagakure blood today but I will if I must. Know that I attacked the mines rather than your spice fields. I attacked at dusk when the workers would be gone and the loss of life would be minimal to none. I do not know what you will think of me for my actions but I hope one day you see that I did everything I could to preserve the lives of your people. Likewise, if you drop your weapons, if you remove that cloak and leave your tools in the sand, I will extend that same courtesy to you both. We can walk away from this with the mines being the only casualties." Her voice rang out, harsh but true. This was the only warning she would give them after the life of her student had been put into jeopardy. "Yui-dono...I implore you, one last time, rethink your decisions here." They were the same words that the monk had said when the fight began. She hoped the monk would take her own advice. She had grown to like the woman. How strongly she held herself after finding out the loss of her husband. A woman that strong was one she wished no ill of. A warrior that strong was one she wished to cross paths with again and again. The beast within her did not speak but had lent her it's chakra. She did not know if it was willingly or forced but it was the first instance that the Hachibi had responded to her. Once this was over she would have time to smile about that. Once she and Astora were safely on their way back to Kumogakure. Precoging 1/4 attacks for Sahara's attack on Astora and acting before it. The monk's ranged attack was able to connect with the green haired girl's sand; causing her to jump onto her fan as another flying apparatus. It was useful to know that she wasn't confident in her body's inherent strength to just tank a hit from him. He could then assume that he just needed to land one good hit for the fight to end instantly. Though the same could be said for her as well. While he had brute strength on his side, she had what seemed like a variety of techniques at her disposal. With seemingly only a couple of hand motions, another sand clump flew into the air to once again support the kunoichi. Astora assumed she was once again in her element; putting away her fan to seemingly focus entirely on her sand manipulation. He wasn't exactly sure what the fan was for, but the absence of it did nothing to put him at ease. The sand in the area around him began to shift, and then lung towards him suddenly. As the sand began to move towards him, the young monk's body reacted by activating one of the few techniques derived from buddhism that he had actually bothered learning. The young monk would drop down to one knee and extend his arms to the right and left; emitting his force of will into a dome that surrounded him. The energy barrier would intercept the incoming sand; acting as a new target for the tendrils to entangle. This position left Astora quite vulnerable since if he moved the barrier would break and the sand would get in. It would be at this point that his sensei's attack would come into the picture; aiming to cancel the green haired shinobi's attack all-together. The speed in which his sensei moved was something he had never seen; and the power was unmatched. The monk would hold up his barrier if the sand remained around it after his sensei's attack. Otherwise, he would lower the barrier and stand up to face his attackers. Haruko spoke harsh truths about their mission and the determination they had brought with them. Neither she nor Astora wished to kill these people, but the plateau needed to go. He would extend his hand with the cannon and face it towards the women; ready to begin charging his laser at a moment's notice. Although his sensei had spoken so eloquently, he felt it was necessary to let them know that they both felt the same way. "I know it's not easy. In fact this might be the most difficult thing to ask of you. But please... Give up this fight." A pang of guilt began to spread within the monk's chest as he stared at the Sunagakure women. Where was the justice here? His morals were conflicted, but he would stay true to his mission. There would be much to discuss when they returned to the village. The samurai woman was quick to dodge, which Yui expected. She watched as the blur of a woman went to close the distance to Sahara, who was easily dispatching the other soldiers. She would stop her attack as the woman dashed off and prepare a defensive stance once more. She was just barely able to dodge the slash toward her, fearing that Sahara might not be able to fare so well. Once more Haruko’s voice called out that she wished no bloodshed should they only lay down their weapons. It was ironic that either of them pleaded with the other so, she thought. She would have thought Haruko would’ve realized already that it was rather futile. As Yui spoke she would move slightly forward, just within range. “My decisions were laid out before me well before this day, when I chose to serve Sunagakure in the capacity that I do,” she said solemnly, but loud enough of course for the Kumogakure shinobi to hear. “I thought we had understood each other on those terms, at least. I will cause you no harm, as I respect you and see your student is one of my practice, but you must understand. Simply leaving and turning a blind eye to the destruction of something important to the country I am sworn to serve is not an option either.” As soon as her speech ended, she thrust a palm out that sent a shockwave once more toward Haruko and Astora’s direction. With the hopeful distraction in place for the briefest of moments, Yui would move her hands quickly into the position necessary for the next move. It was a brief hand position, and materializing behind her was a large spiritual being, its many arms fanning out. She held the position out toward Haruko, waiting for her to approach once more and ward her off. She had no plan aside from distraction, knowing she couldn’t beat the woman. She hoped Sahara could pull something off. The first of the arcs of chakra struck Sahara across the chest, the woman's body being knocked off of her sand platform. The second wave of energy struck the first and compounded the blow into a driving one that sent the Jounin slamming into the sands; a small plume of the particles shooting upward around the woman's frame. The strikes were not meant to kill by any means but they still hit with a force able to knock out any normal person. Being hit by two of them would almost certainly spell the end of the fight for the Satetsu. A few broken ribs and a bruised sternum would be the worst of her injuries once she recovered however. The platform of sand she had been standing on fell into the desert like a drop of water into the ocean. The four arcs of power struck the remaining mines unimpeded, the sound of glass shattering filled the air as the last of Sunagakure's resource was destroyed. A screaming and cracking sound, but a victorious one for Kumogakure. Both of these events insured that Astora was safe and the samurai let out a low sigh of relief at that fact before turning to see that Yui had managed to dodge the blows aimed at her. On one hand that was a good thing, she would hate to see the monk in the position Sahara was in. On the other it was a troublesome thing, as the woman's resolve did not seem to wane in lieu of her partner's defeat. Another surge of respect went through her then. Yui was definitely someone of admirable qualities. It was a shame then that those qualities would be a driving factor today. Her eyes narrowed as the monk responded but the tone, the choice of words, those spoke volumes themselves. She knew Yui wouldn't walk away from this by choice. Inwardly she grit her teeth. This was the unluckiest of scenarios. She would be forced to incapacitate both of them it seemed, she sheathed a single of her eight swords. Her voice interrupted the monk's. The image of Haruko disappeared as it had before as the movement of the monk's Sohei began. Yui's eyes would again betray her as the samurai's speed, now pushed to the full extent of it's abilities, would carry her behind the monk in the blink of an eye. She listened to the breath of her opponent and right when it was apparent that Yui would act the sword flickered out of it's sheath, the flat of the blade striking the monk's arm down and breaking whatever action she had been planning. Another movement, faster than the blink and the sword was sheathed again. In the same fluid motion however the sword erupted from it's sheath with a fury yet unseen from Haruko. Aiming to strike the blow against the shoulder and neck of Yui, it was a blow that would instantly knock the woman unconscious should it hit. Either way a shockwave would extend past the blow carving a scar in the sands from the very draw of the weapon. It all would happen in the same blink. The same second. A series of graceful but devastating blows. She knew that Yui's speed was not close to hers. She knew that her coordination and dexterity paled in comparison. Despite all of these things they were equal warriors in the samurai's eyes. The monk had fought until the very end and fought proudly. She had earned not only Haruko's undying respect, but she had earned her life that day. Haruko was unsure if any other of Sunagakure's shinobi would have gotten off so easily after her warning. "The mines are already gone. You can rest now knowing you fought well until the end." She would say if her strikes landed. If they didn't then she would simply wait to interrupt and counter whatever else the monk had planned. She was aware of her opponent's prowess at this point and knew that this battle was won. It appeared that the remaining enemy was more similar to the two kumo fighters than Astora had originally thought. She followed the same code of ethics that the young monk did, and wished to protect their village just as they did. The only differences between the two was the village they represented, and the allies they fought to protect. It would have been easier if the woman was vicious or cruel, but it seemed that neither side really wanted violence. Unfortunately for the Sunagakure monk though, there wasn't time to negotiate. "We need to completely destroy the glass plateau. Sunagakure will just rebuild the mines if we leave it like this. The only way to actually finish the mission is to fully destroy this resource." If his sensei agreed, Astora would then dash up a sand dune past the edge of the glass plateau in order to distance himself from the attack they would create. "Let me know when you're ready sensei. Count us down and we can fire simultaneously." With all of Haruko's talk of sparing the enemy, Astora knew that she would move the two Sunagakure forces out of the way before she got into position. The monk would never go through with the attack if it meant that it would hit the two women who had just fought them so honorably. The monk's eyes would flash purple once more as he felt the mysterious chakra flow through his body. Metal began to shape in the palm of his left hand as well, creating yet another cannon for him to shoot from. He would extend both his transformed arms towards the glass plateau; aiming for the center of the majestic land of glass. When Haruko began the countdown, bright blue and white chakra would begin shining from the monk's hand cannons. He had made his decision, and if his sensei agreed with him, then there was nothing else to think about. He would go beyond what he thought he could contain within this one attack. As the countdown finished, two massive white lasers would erupt from the man's arm; seeking to annihilate the land in an instant. This was his justice now. Yui could barely see her coming, something she had come to expect. Despite knowing defeat was upon her since the beginning, she did not feel frightened. It was troublesome only that Kyon would be worried about her, especially upon discovering she had injuries, but beyond that she had confidence that she would not die. Haruko and her student seemed honorable people, and she hoped her assumptions in that regard were correct. When the samurai woman charged forth, Yui knew the battle was over. She took a deep breath as the blows struck, the pain racketing through her body. Yui grit her teeth, removing her mind from the pain as much as possible. She heard Haruko’s voice, faint in the distance as her consciousness wavered, and knew her assumptions hadn’t been wrong or her faith misplaced. She went peacefully into that dark world of unconsciousness then, knowing all might be well. She wished she could have done better, but such was life. She didn’t have the time to reply to Haruko, but perhaps the woman would know by the look in her eyes her thanks and admiration. With that, Yui would be knocked out. The flat of her blade struck true, a resounding blow that would resonate through the monk's body. Behind Yui the sands would erupt in a straight line as the force of Haruko's draw sundered the desert. Once the blow landed the samurai noticed two things in the monk's eyes. A look of thanks and then the telltale dimming of someone losing consciousness. In a flurry the Jounin dropped her swords and lunged forward, one hand wrapping around the now limp form of Yui and the other reaching out to catch her scythe so that no involuntary impalement would occur. Slowly she lowered the body of her opponent to the ground. It was during this that Astora's voice called out. His plan wasn't foolish, per say, but it was currently impossible. They didn't possess the abilities or strength required to pull off such a feat. Besides, even if they shattered the plateau it would still be glass at the end of the day. They could only take solace in the destruction of the mines and the setback that it would place on Sunagakure. Standing tall over her downed foe, she shook her head softly. "No. There's no need for that Astora. We've done enough today. You are right, that in the future they can rebuild and salvage the wreckage that we have caused, however that will cost time and money. Besides that destroying the plateau doesn't rid them of the glass, it only makes it a little more difficult to gather. We've accomplished our mission and I'm sure these two weren't the only ones informed of our presence. Get ready, we'll be leaving soon." She motioned to one of the men who had accompanied them onto the battlefield and the nameless shinobi dashed over. "Rope." She said shortly and the man quickly dug into his pouch and produced a bundle of said item. With a heavy sigh the samurai pulled Yui to a sitting position and removed her cloak. The still features of the monk struck Haruko a fierce blow but she swallowed down the pain. Her eyes looked over the monk for any other weapons until she noticed the hilt of a sword. She took it and placed it with the woman's scythe before bending over and hoisting the woman's body over her shoulders. Deliberate steps led her to Sahara's location, the other Jounin still unconscious from being struck down earlier. Carefully placing Yui down, she left her in a sitting position. She removed the fan from Sahara's back, the weapon miraculously in one piece after the woman had been sent careening into the sands back first. She then sat Sahara up as well and moved her to be back-to-back with Yui. "I'll need that rope now." The man who had followed her over quickly nodded and handed over the bundle. She moved quickly, tying Yui's hands behind her back and then Sahara's. Double checking the knots she seemed satisfied and stood, wiping the sand off of her hands. "We'll be taking their weapons so even if they regain consciousness as we make our leave they won't be able to attack us from behind." She said coolly as she bent over to pick up the fan she had taken from the Satetsu. It wasn't exactly a "To the victors go the spoils" moment, but it wasn't that far off. She then made her way over to her and Yui's weapons and slowly retrieved her swords. Each was wiped down before it was sheathed and she stopped once she had moved to Yui's sword. The design was familiar as she hoisted it from the sands. Once her hand had gripped the weapon she was certain that what spoils she had won was no ordinary sword. "Kusanagi." She whispered. A sword of legend now in her grasp. She would have to present this to Lady Shizuka. Sliding the sword and sheathe into the space on her hip amidst her other swords, she finally picked up the scythe and made her way over to Astora, placing the weapon across her back using Banryu as a way to wedge it in place. "We go. Now. Once we're clear of the Land of Wind we can slow down, but until then we don't stop for anything, understand?" She said hastily as she began to walk past her student. After a few steps though, her voice would call out behind her, "And Astora? Good job. You did exceptional today." And with that, the small squad would begin the long walk home. Even with his sensei's crazy power were they really too weak? As his sensei retrieved rope from their back-up and began to tie up the two kunoichi, Astora would lower his arms and begin to manipulate his body to return to normal. The cannons in his hands would submerge back into his body, and the metal tail would fall off of him. The logic that Haruko laid out made sense, but there was a bit of him that still felt that they had to try. It was true that even if they destroyed the plateau, they would still be able to collect the shattered glass afterwards, but still... with a clenched fist, the young monk nodded to his sensei. "Yes. You're right. I may have gotten caught up in the moment." After they had seized the sunagakure shinobi's weapons, they would leave the area to return to their home. As they left, his sensei gave him some slight praise on the mission. A small smile appeared on Astora's face as he followed behind Haruko's petite frame. Yes. There's no need to rush. I will catch up bit by bit. In almost a moment's notice the battle was decided. Sahara's grand attack had been thwarted. Yui's opponent displayed an intense speed that she could never dream to combat, allowing her to get the jump on Sahara. The battle was seemingly over as soon as it began. The duo of women fought heart, but they were simply outclassed. Sahara was effectively knocked out, only being conscious to hear a few more words being uttered. While she cared more for the protection of the village, she only hoped death would follow suit. But that wasn't the case. This was now something she was going to have to live with. Her village was attacked and there was nothing she could do about it. She did everything she could, and it was not enough. Hazy vision came with instant realization as Sahara came to. She tried to move her arms but found her hands to be constricted by rope. Sahara easily freed herself from the rope, a simple technique that her sister had taught her before she started at the academy. Sahara turned over to see Yui still unconscious but in a similar condition to herself. As Sahara gained full awareness of her surroundings, her hands fell to her side to realize something was missing. Her fan. "W-wait, where is it?" Sahara shot up from her position and scanned the immediate area. She looked around Yui to see if it had been lying around somewhere. "No, no, no, it has to be around here somewhere. " Sahara hands maneuvered in the same fashion as a conductor as she released waves of chakra which would allow for her to control the sand around her. Sand would be sent flying in multiple directions, eventually creating a large cloud of dust over the area. "It's gone....." Her memories were suddenly refreshed on what all happened prior to her coming to. The mines were destroyed and now her most prized possession was gone. Sahara winced in pain, left hand shooting up to where she had taken the final blow from Haruko. "Too much has been lost......I'm not sure I'll ever forgive myself......" As the clouds of sand settled, a sudden figure made their appearance. A woman with brown hair and brute stature appeared wearing a doctor's coat. The woman had very similar features to Sahara, but had a lot more meat on her bones than the toothpick-like woman. The voice and appearance called out to Sahara and only her. "You know what must be done now.....You can't keep running from your past.......Flora." Sahara turned to look at the figure to see nothing at all. "This is our rock bottom. From here on, we will either grow or remain at the bottom. We must transcend." Sahara walked over to Yui and untied her hands. "You fought valiantly. Much better than I. " After doing so, she would condense the surrounding sand into a platform which would seek to carry them both to the nearest hospital. As the duo flew into the air, Sahara couldn't help but to look at the surrounding area. She only wished to have been destroyed along with it. But just as the mines would be rebuilt so would she rebuild herself. Sunagakure had a habit of bouncing back even after the most costly of lost. This would be no exception.